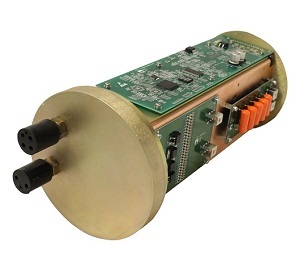 The Thermal Wall Amplifier module is an easily packaged sea water-cooled broadband amplifier module. It comes as a 5.7″ (145mm) diameter by 12″ (305 mm) long package that slides into a 6″ pipe housing to save costs. This amplifier is broadband-ready from 400 Hz to 12 kHz with analog and digital inputs, a full DSP implemented exciter, and an onboard power converter to allow powering direct from 28 volts DC, making it very simple to package and power with ordinary batteries. The H Bridge inverter is populated with state of the art Silicon Carbide FETS and has a 2.5 kW power rating. The amplifier can handle wide ranging reactive loads. The amplifier also contains an output transformer giving maximum load connection flexibility. A full range of configurable alarms plus output V and I are available at the customer control interface.